The base—called a Smart Base—recognizes the different attachments and offers the correct set of smart programs for that particular attachment, whether it’s single-serve smoothies, extractions, refreshers, or dressings for the blender cup; doughs, purees, dips, or chopped foods in the processing attachment; or snow cones, ice cream, frozen drinks, or larger quantities of smoothies in the large 72-ounce blender jar. One of the truly unique features of this blender is the spiralizer attachment that has two different spiralizing blades so you can turn your zucchini and other vegetables into noodles or ribbons. All of the options are controlled from a touch screen that easily wipes clean, and when you’re done whipping up zoodles and margaritas, cleanup is easy since all of the attachments are dishwasher safe. Let’s face it, most blenders are used for smoothies, milkshakes, and blended cocktails, so additional features and large pitchers might be a waste of storage and counter space. This handy 1000-watt blender is all you need for those simple drinks since it’s got the power to crush ice and seeds and can easily blitz a frozen banana for a refreshing drink any time of the day. This includes one 18-ounce cup, one 24-ounce cup, and one 32-ounce cup, so you can make large drinks for one or make enough to share. This also comes with two spout lids, so you can remove the cup from the blender, attach a lid, and take your tasty blended beverage to go, whether you’re headed to work or you’re going out to the backyard to enjoy the day. Designed to be easy to use, this operates at the touch of one of the buttons to pulse, blend, or ultra-blend in a pattern that gives the best result every time. When you’re done sipping, all of the attachments are dishwasher safe, so cleanup is a snap. Possibly the most simple of the Ninja blenders, this compact unit doesn’t have any buttons. Just attach a cup and press down to blend. The blending stops when you release it, so pulsing ingredients is just as simple and easily controllable. This comes with a 24-ounce cup and an 18-ounce cup along with two sip-and-seal lids that let you take your drink on the road. Since this doesn’t come with multiple accessories, this will take less space to store, yet you have a spare cup so you can toss one in the dishwasher and still have a clean one that’s ready to use. The cups and their accessories are all ​dishwasher safe for easy cleaning. The large 72-ounce pitcher that comes with this blender is great for making margaritas for a crowd or for blending morning smoothies for the whole family. If family members have different preferences, you can choose to use the three Nutri Ninja cups with their sip-and-seal lids to take your beverage on the go, whether you’re headed to school, work, or the backyard. The cups are in three different sizes: 18 ounces, 24 ounces, and 32 ounces. This blender features Ninja’s Auto IQ technology with blending programs that are perfect for blending, ultra-blending, pureeing, pulsing, or making smoothies and frozen drinks. You can also choose to blend manually at low, medium, or high speed. For easy cleaning, all of the attachments are dishwasher safe, so you’ll be ready for tomorrow’s breakfast with no fuss. Whether you’re chopping salsa for one or for a crowd, this blender has you covered. Rather than a base unit that sits on the counter, this has a power pod that sits on top of the included containers. The 16-ounce bowl is the one you’ll choose for just a little salsa or a garnish, while the 40-ounce food processing bowl can handle enough for a party. The 48-ounce pitcher is large enough for making blended drinks, frozen drinks, and smoothies, yet it’s not overly large, so it’s easy to store when not in use. All three jars include lids, so you can prep your food, then store it to serve later. All the jars and accessories are dishwasher safe, so cleanup will be a breeze. 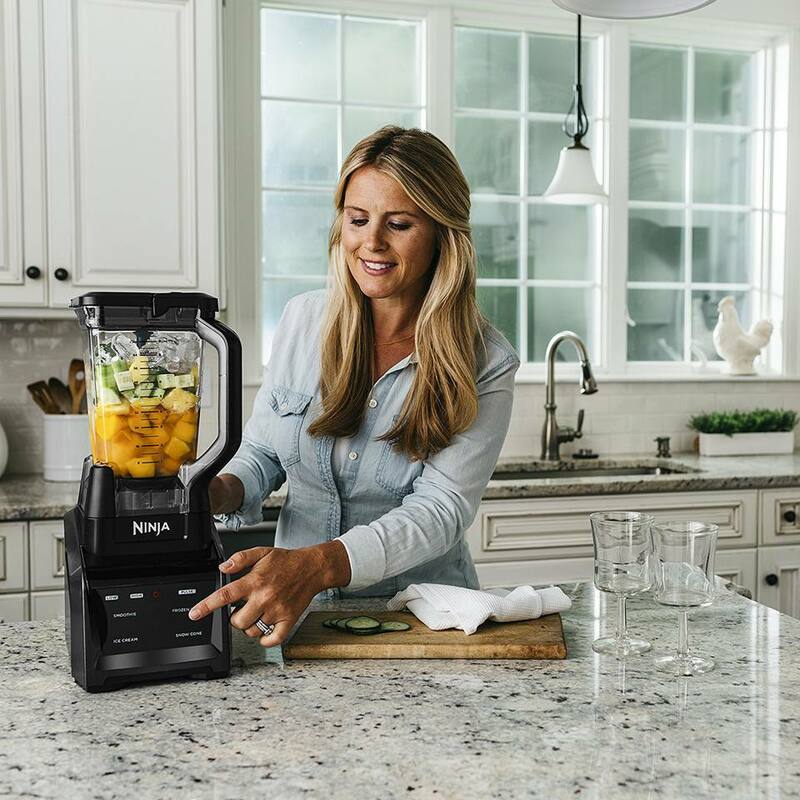 This dual-use blender includes a short, squat blending “bowl” along with two more standard 24-ounce Nutri Ninja blender cups for smoothies and blended drinks. The short, squat, 32-ounce bowl is designed for chopping, blending, and making doughs for cookies or pizza dough. The Auto-IQ system offers several buttons for specific functions, so it pulses, blends, and pauses in a pattern that’s perfect for your smoothies and more. You can also choose manual control. A digital counter shows the amount of time left if you’re using a program, while it counts up to show how long it’s been on when you’re operating it manually. Auto IQ Boost gives you extra power when you need it. When you’re done blending and sipping, all accessories are dishwasher safe, so cleanup is fast and easy. There are 10 preset programs that pulse, pause, and blend in a specific pattern to give you the perfect results every time, or you can select one of the manual modes with variable speed control for custom results. The pitcher is a large 72 ounces, so you can make large or small recipes, and a tamper is included to push foods into the blades. When it’s time to clean the blender, just add a few drops of dish soap and some hot water and run the clean program, then just rinse and you’re done. If you prefer, you can also clean the attachments in the dishwasher, along with the rest of your dishes.